The aim of this article is to describe the methodology of exclusively endoscopic cadaveric middle ear dissection. Moreover, we aim to provide a comprehensive guide to endoscopic middle ear anatomy. Anschuetz, L., Presutti, L., Marchioni, D., Bonali, M., Wimmer, W., Villari, D., Caversaccio, M. Discovering Middle Ear Anatomy by Transcanal Endoscopic Ear Surgery: A Dissection Manual. J. Vis. Exp. (131), e56390, doi:10.3791/56390 (2018). The middle ear is located in the center of the temporal bone and bears a highly complex anatomy. The recently introduced exclusively endoscopic transcanal approach to the middle ear is a minimally invasive technique sparing the bone and mucosa of the mastoid bone, since the middle ear is accessed through the external auditory canal. This emerging method has several advantages over the traditional (microscopic) approaches to the middle ear such as the panoramic wide-angle views of the anatomy, the possibility to approach and magnify tiny structures, and the possibility of looking around the corner using angled endoscopes. The cadaveric dissection method presented here consists of an overview on the technical requirements and a precise description of a step-by-step protocol to discover the anatomy of the middle ear. Each step and anatomical structure is carefully described in order to provide a comprehensive guide to endoscopic ear anatomy. In our opinion, this is particularly important to any novice in endoscopic ear surgery as it provides thorough anatomical knowledge and may improve surgical skills. The middle ear is located in the center of the temporal bone and bears a highly complex anatomy. The most contiguous structures are the facial nerve (FN), the cochlea (CO), the ossiculary chain (OC), the jugular vein bulb (JVB), and the internal carotid artery (ICA). The middle ear cleft is anatomically divided in five parts: the epitympanum is located superiorly, and is interconnected by the antrum to the mastoid air cell system (MACS); the retrotympanum posterior is a system of bony bridges and more or less shallow sinuses; inferiorly lies the hypotympanum; anteriorly is the protympanum with its connection to the Eustachian tube; and in the center, lies the mesotympanum1. The physiological access through the external auditory canal (EAC) is narrow. Therefore, the standard surgical approach to the middle ear requires a retroauricular incision and the drilling of the MACS. These kinds of interventions are performed using an operating microscope. Its introduction was a milestone in otologic surgery, since it allowed the treatment of the microscopic middle ear structures. However, the microscope has a forced straight view and some areas, especially the sinus tympani, are difficult to access. This bears the risk of residual disease especially during cholesteatoma surgery2,3. Moreover, healthy tissues of the EAC, MACS, and middle ear have to be removed simply for access purposes. This not only extends the operating time, but also accounts for more surgical morbidity and a prolonged healing time4. Recent advances led to the introduction of the endoscope as a powerful tool for ear surgery. The endoscope was first used to assist the conventionally operating surgeon to visualize the hidden areas of the middle ear. Technical and surgical refinements allowed the introduction of the endoscope as the main operating tool5. The main advantages of the endoscope are the panoramic and wide-angled views of the middle ear. For instance, the otherwise hidden retro- and hypotympanum may be accessed using an exclusive endoscopic transcanal approach without a canaloplasty6. A recent study showed superior visibility of all middle ear compartments using the endoscope when compared to the microscopic technique7. The use of angled endoscopes (30° and 45°) further improves visibility and allows dissection with a view of the most hidden areas of the middle ear. However, endoscopic ear surgery (EES) is a one-handed surgical technique, as the second hand generally holds the endoscope. This issue and the narrow space inside the EAC require training to improve the surgeon's skills to safely apply the technique in patients. In general, the gold standard for surgical training is considered to be cadaveric dissection. In cases of unavailability of cadaveric specimens or local ethical issues, an animal model for the training of endoscopic ear surgery has recently been described8. Surgical training is considered an important factor in the education of trainees in a novel technique9. Despite the importance of surgical training, a concise description of the important considerations on how to perform cadaveric dissection is still lacking in the literature. The aim of this article is to describe the methodology of exclusively endoscopic cadaveric middle ear dissection. Moreover, we aim to provide a comprehensive guide to endoscopic middle ear anatomy. The present study was approved by the local institutional review board (KEK-BE 2016-00887). Position a vacuum mattress on the dissection table and cover it with a sterile blanket. Lay the anatomical specimen in a surgical position on the mattress with the head slightly rotated to the contralateral side. Retract the tragus with a flexible hook to the contralateral side. Cover the specimen with a blanket sparing the external ear, just as in the operating room. NOTE: Please see the Table of Materials for a complete list of equipment required. Adopt a comfortable standing or sitting position and adjust the endoscope screen. This is an important issue to prevent hardening of the neck muscles and therefore faster exhaustion. Perform the white balancing in your camera menu and apply a drop of anti-fog solution on the endoscope tip. Hold the surgical instruments in your dominant hand and the endoscope in the other hand. Introduce the 0°, 3 mm diameter, and 15 cm length endoscope into the EAC. As a first task, clean the EAC thoroughly from eventually present ear wax using the suction tube. Rinse the EAC with water. Cut the hair inside the EAC with a pair of small scissors to prevent the endoscope from becoming dirty during every passage. Note: In endoscopic ear surgery, the TMF is performed slightly smaller and in a triangular shape. The reason is the limited space inside the EAC. Incise the EAC skin superiorly, slightly anterior to the short process of the malleus using a sickle or a round knife. Extend the incision to the posterior superior portion of the EAC and prolong the incision to the anterior and inferior border of the TM to configure a triangular shaped flap. With the 45° angled round knife, expose the bone and elevate the skin until reaching the annulus. It is important to strictly adhere to the bone. Elevate the annulus with the round knife to access the tympanic cavity (TC). The mucosa of the TC is slightly more transparent than the skin and is incised at the level of the chorda tympani using a hook. Mobilize the annulus inferiorly and anteriorly using the Thomassin dissector. Identify superiorly the posterior lateral ligament of the malleus (PLML). This ligament represents the inferior limit of the Prussak space. Grasp the ligament with the Hartmann forceps and pull it gently anteriorly in the direction of the umbo until uncovering the short process of the malleus. From the short process of the malleus, continue the dissection and incise the periostium of the malleolar handle towards the umbo with a needle dissector. It is important to detach the TM in the right plane to prevent accidental perforations. Detach the TM completely from the manubrium. A dry cottonoid may be helpful, since it facilitates the identification of the correct layer and its dissection. Once the umbo is reached, cut the remaining fibrous layer of the TM using a micro-scissor. NOTE: This part of the dissection aids in the recognition and rehearsal of the middle ear anatomy. Each subdivision of the TC should be explored separately using 0° and 45° endoscopes. Eventually present folds or adherences should carefully be removed. We dissected a total of five whole head specimens and 12 temporal bone specimens (n=22 sides) using the described instructions. The different regions of the TC were documented photographically and further analyzed. All regions were explored using 0° and 45° endoscopes. We conducted a complete exploration of all anatomical regions and identified all mentioned anatomical landmarks. The anatomical structures are illustrated according to the progress of the dissection. Figure 1 illustrates the Prussak space and the malleolar ligaments, whereas Figure 2 demonstrates the anatomy after complete TMF elevation. The wide-angle view allows the visualization of the meso- and hypotympanum as well as parts of the epi-, retro-, and protympanum. In Figure 3, the superior retrotympanum is shown as it appears in a 45° endoscope, while the surgeon is standing on the opposite side of the table. Figure 4 illustrates in detail the protympanum with a dehiscent ICA. After removal of the OC and transcanal atticotomy the epitympanum is inspected until the lateral semicircular canal and the antrum as shown in Figure 5. No specimen required canaloplasty to perform complete exploration of the tympanic cavity. The identification of the anatomical structures was possible in all specimens using the 0° and 45° scope. However, the complete exploration of the retrotympanum, especially the facial recess and the sinus tympani, was not possible in 27% of the cases (n=6), since these bony bays were too deep to be completely explored. Figure 1. Left ear, 0° endoscope: View of the Prussak space and the surrounding ligamental folds of the malleus. 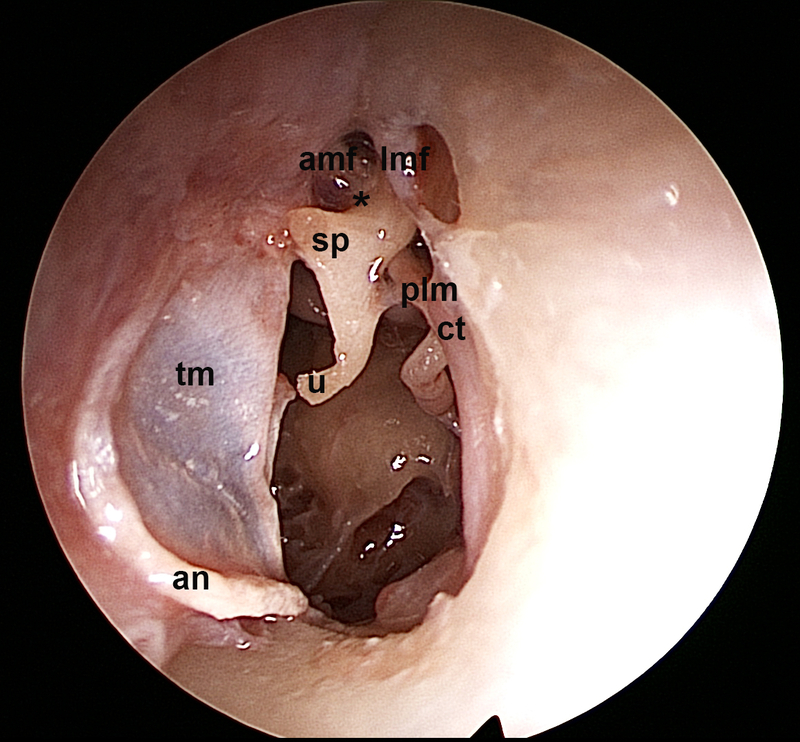 tm: tympanic membrane, an: annulus, u: umbo, sp: short process of malleus, amf: anterior malleolar fold, lmf: lateral malleolar fold, plm: posterior ligament of malleus, ct: chorda tympani, *: Prussak space Please click here to view a larger version of this figure. Figure 2. 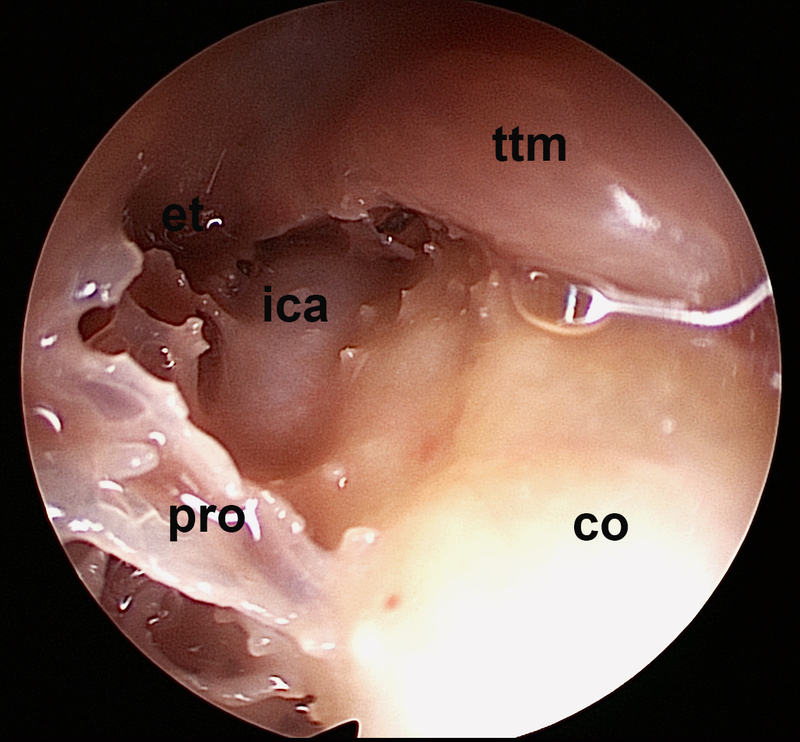 Left ear, 0° endoscope: View of the tympanic cavity after elevation of the tympano-meatal flap. The meso- and hypotympanum as well as parts of the epi-, retro- and protympanum are visualized. pr: promontory, jn: Jacobson nerve, hy: hypotympanum, fi: finiculus, sst: sinus subtympanicus, se: styloid eminence, pe: pyramidal eminence, st: stapedial tendon, isj: incudostapedial joint, fn: facial nerve, u: umbo, m: manubrium, sp: short process, n: neck of the malleus, ttm: tensor tympani muscle, ttf: tensor tympani fold, ica. Internal carotid artery Please click here to view a larger version of this figure. Figure 3. Right ear, 45° endoscope, contralateral position of the surgeon: The superior retrotympanum is illustrated using an angled endoscope. fn: facial nerve, s: stapes, st: stapedial tendon, ps: posterior sinus, fp: footplate, po: ponticulus, pe: pyramidal eminence, sit: sinus tympani, sub, subiculum, se: styloid eminence, sst: sinus subtympanicus, ap: anterior pillar, teg: tegmen, pp: posterior pillar, rw: round window, fu: fustis, tu: subcochlear tunnel Please click here to view a larger version of this figure. Figure 4. 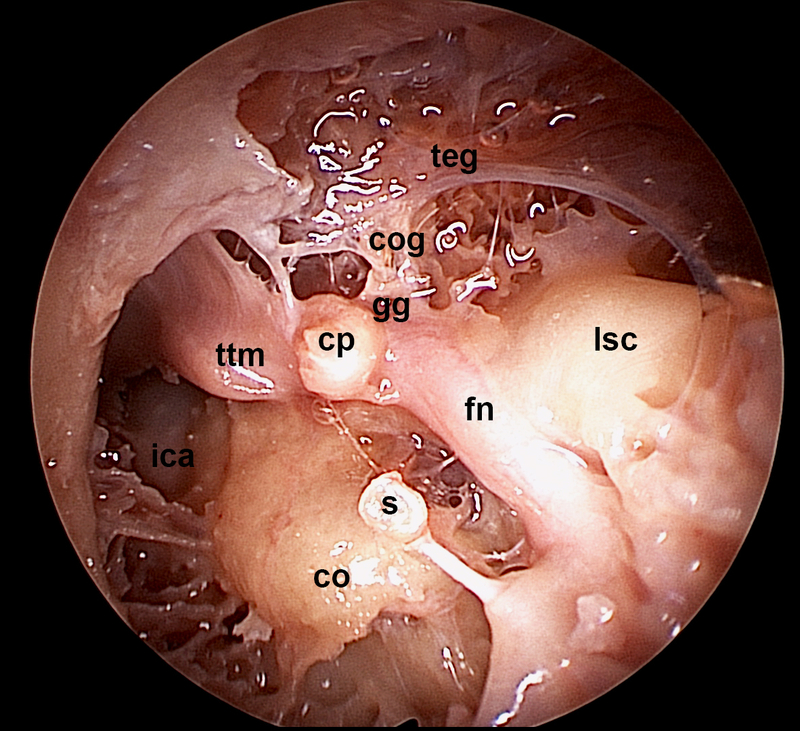 Left ear, 45° endoscope: Detailed view of the protympanum. Note the dehiscent carotid artery. et: Eustachian tube, ica: internal carotid artery, pro: protiniculus, co: cochlea, ttm: tensor tympani muscle Please click here to view a larger version of this figure. Figure 5. 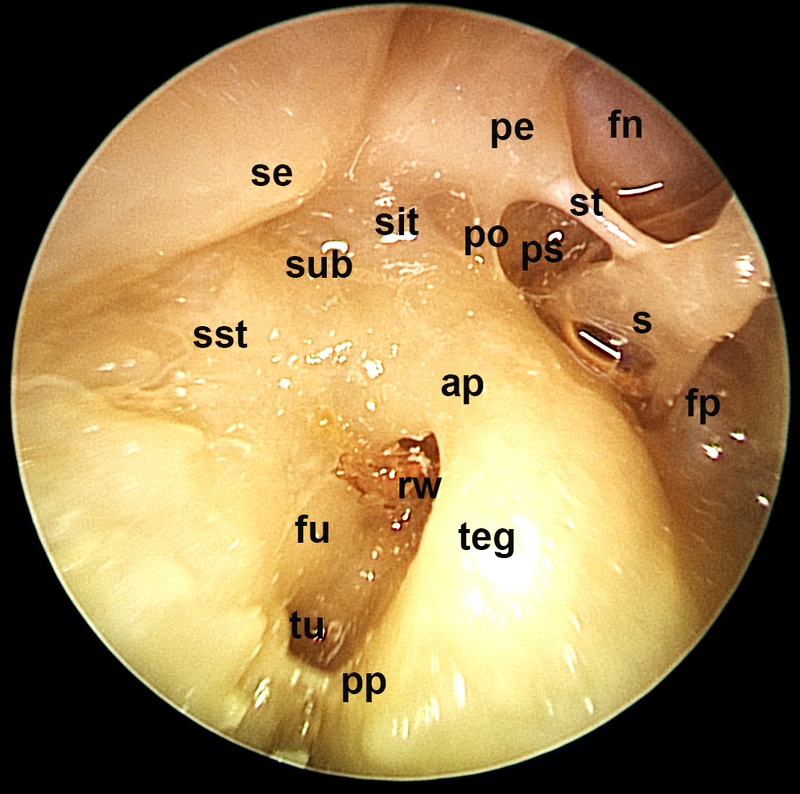 Left ear, 0° endoscope: After removal of the incus and malleolus and curettage of the scutum, a wide overview of the tegmen tympani and the antrum is illustrated here. Note the lateral semicircular canal and the tensor tympani muscle being in one line with the facial nerve crossing. 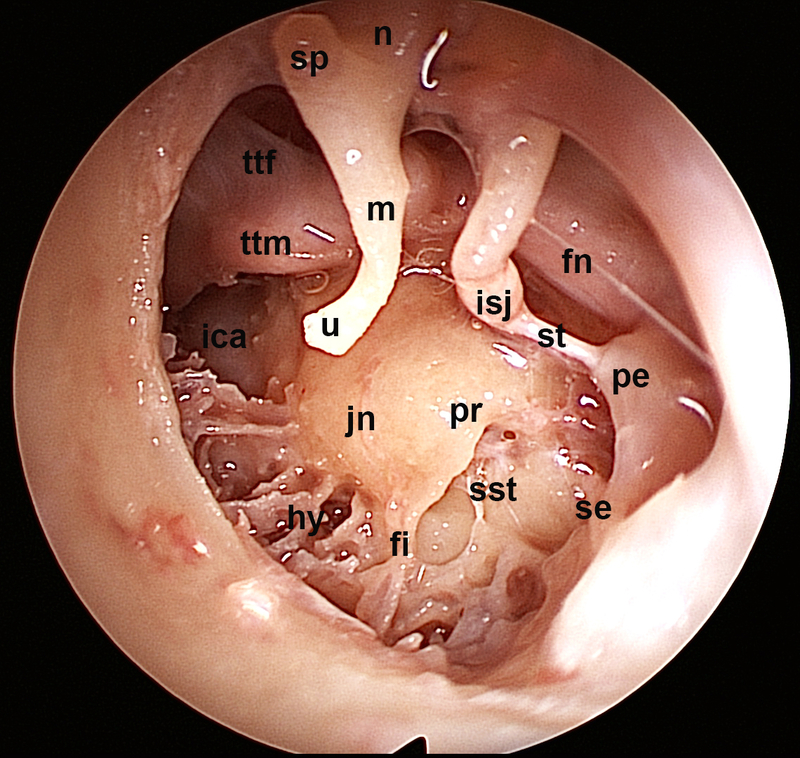 teg: tegmen, cog: COG or transverse crest, gg: geniculate ganglion, cp: cochleariform process, ttm: tensor tympani muscle, lsc: lateral semicircular canal, fn: tympanic segment of facial nerve, s: stapes, co: cochlea, ica: internal carotid artery Please click here to view a larger version of this figure. The proposed dissection manual is useful for performing a complete anatomical dissection of the middle ear. Exhibiting a thorough knowledge of middle ear anatomy is a fundamental prerequisite for any middle ear surgical intervention. Cadaveric dissection allows training the handling of the camera and the surgical instruments in the EAC. For a novice in EES, the coordination between the eye and the instrument as well as the correct handling of the endoscope (no bending, maneuvering between important anatomical structures as the ossicles in a limited space and the two-dimensional image) are critical steps to get started with this emerging surgical technique. The main limitation of this model as compared to the real surgical situation is the lack of bleeding. This applies for any cadaveric dissection model. Recently, Dedmond et al. described a temporal bone model, where bleeding was simulated during the elevation of the TMF. This model may in fact be a good option for advanced surgeons already used to EES. In our experience, the initial familiarization with EES should be as easy as possible, since the handling of the instruments is already a challenging task. The cadaveric dissection is considered the gold standard for surgical education. However, it is subject to high costs and ethical regulations. In comparison, synthetic or animal models may overcome these issues8,11. However, in synthetic models the tactile feeling for the tissues is difficult and the resolution of 3D printing is not yet able to provide all details an anatomical specimen can. In contrast, the animal model provides excellent tissue properties but has a different anatomy. We can consider the cadaveric model the sole suitable model for anatomical teaching, whereas synthetic and animal models provide cheap alternatives for surgical training. Compared to the microscopic technique for middle ear dissection, the endoscope allows the observation and preparation of the delicate middle ear structures through a natural orifice, the EAC. Hence, no bone has to be removed for access purposes and the middle ear can be studied in its natural state. Moreover, the endoscope allows a very close observation of any anatomical structure and thus also magnification without losing illumination. Of course, the endoscopic approach does not teach mastoidectomy, which may be performed on the same specimen after endoscopic dissection. The endoscopic technique for ear surgery is internationally spreading and therefore the need for suitable surgical training will increase. The authors declare no conflict of interest. LA holds a research fellowship by the Bangerter-Rhyner Foundation, Bern, Switzerland and by Karl Storz GmbH, Tuttlingen, Germany. The funders had no role in study design, data collection and analysis, decision to publish or preparation of the manuscript. Endoscopic Ear Surgery. Presutti, L., Marchioni, D. Stuttgart, New York, Delhi, Rio, Thieme. (2015). Weiss, M. H., et al. Surgery for recurrent and residual cholesteatoma. Laryngoscope. 102, 145-151 (1992). Pickett, B. P., Cail, W. S., Lambert, P. R. Sinus tympani: anatomic considerations, computed tomography, and a discussion of the retrofacial approach for removal of disease. Am J Otol. 16, 541-550 (1995). James, A. L. Endoscope or microscope-guided pediatric tympanoplasty? Comparison of grafting technique and outcome. Laryngoscope. Epub ahead of print (2017). Tarabichi, M., et al. Endoscopic management of limited attic cholesteatoma. Laryngoscope. 114, (7), 1157-1162 (2004). Bonali, M., et al. The variants of the retro- and hypotympanum: an endoscopic anatomical study. Eur Arch Otorhinolaryngol. Feb 27 [Epub ahead of print] (2017). Bennett, M. L., Zhang, D., Labadie, R. F., Noble, J. H. Comparison of Middle Ear Visualization With Endoscopy and Microscopy. Otol Neurotol. 37, (4), 362-366 (2016). Anschuetz, L., et al. An Ovine Model for Exclusive Endoscopic Ear Surgery. JAMA Otolaryngol Head Neck Surg. 143, (3), 247-252 (2017). Wang, M. C., et al. The costs and quality of operative training for residents in tympanoplasty type I. Acta Otolaryngol. 129, 512-514 (2009). Dedmon, M. M., Kozin, E. D., Lee, D. J. Development of a Temporal Bone Model for Transcanal Endoscopic Ear Surgery. Otolaryngol Head Neck Surg. 153, (4), 613-615 (2015). Barber, S. R., et al. 3D-printed pediatric endoscopic ear surgery simulator for surgical training. Int J Pediatr Otorhinolaryngol. 90, 113-118 (2016).